Job developers are involved in creating job opportunities in the market and substantially assist the job seekers in acquiring these jobs. Usual tasks prescribed in the Job Developer Resume include – interacting with employers to elicit job vacancies and internship orders, determining client requirement and recording appropriate data, assisting in securing internships, proposing qualified applicants name to clients, reviewing job applications, matching applicant’s skills and education with that of the employer’s requirements, recording and evaluating applicant’s experience, education, knowledge and training; negotiating and developing permanent or transitional job opportunities and performing career counseling to job seekers. The skills that are expected to be demonstrated in the Job developer Resume are expert communication and counseling abilities, knowledge of human resource management and recruitment processes, skills in establishing public relations and familiarity with various professions. Individuals pursuing a degree in Human Resource management can work as Job developers. 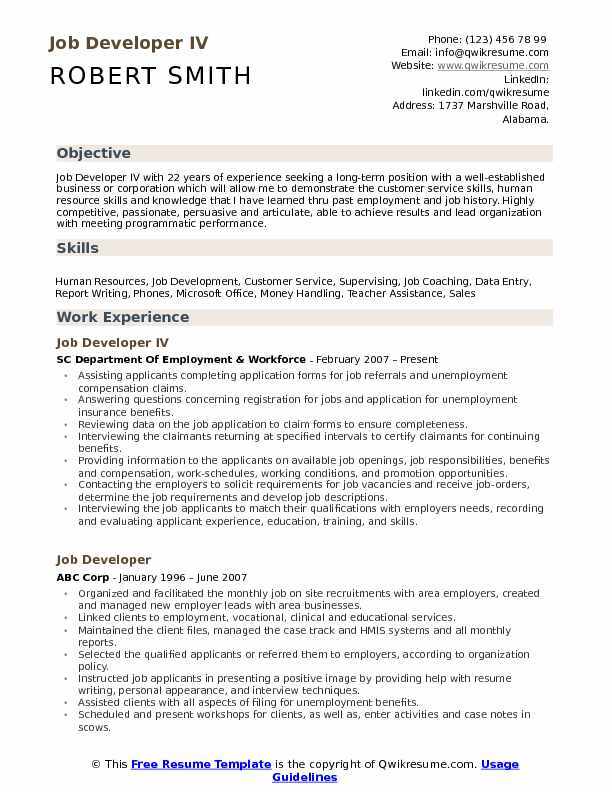 Summary : Job Developer IV with 22 years of experience seeking a long-term position with a well-established business or corporation which will allow me to demonstrate the customer service skills, human resource skills and knowledge that I have learned thru past employment and job history. Highly competitive, passionate, persuasive and articulate, able to achieve results and lead organization with meeting programmatic performance. Assisting applicants completing application forms for job referrals and unemployment compensation claims. Answering questions concerning registration for jobs and application for unemployment insurance benefits. Reviewing data on the job application to claim forms to ensure completeness. Interviewing the claimants returning at specified intervals to certify claimants for continuing benefits. Providing information to the applicants on available job openings, job responsibilities, benefits and compensation, work-schedules, working conditions, and promotion opportunities. Contacting the employers to solicit requirements for job vacancies and receive job-orders, determine the job requirements and develop job descriptions. Interviewing the job applicants to match their qualifications with employers needs, recording and evaluating applicant experience, education, training, and skills. Reviewing the employment applications and job orders to match applicants with job requirements, using manual or computerized file searches. Summary : Job Developer I with 12 years of experience in the Non-Profit domain is seeking to utilize my education, professionalism, training and interpersonal communication skills along with my ambitious drive to make a positive in the lives of individuals and families by equipping them with skills that will lead them to become self-sufficient productive members of their community. Establishing and maintaining a one-on-one relationship with designated clients for the purpose of securing employment opportunities on their behalf. Establishing and maintaining an on-going effective job development marketing strategy for prospective participant employers. Inputting client data into the DOL MIS system and maintaining, updating, and utilizing the data as directed. Completing the necessary case documentation on each client, as established by the program manager. Planning and implementing regular job development activities which result in a pool of employers committed to hiring CPA clients. Preparing, planning, and facilitating the individual and employment group training sessions with integrity and fidelity to curriculum manual as necessary. Recognizing and address client ambivalence and resistance and helping the clients maintain motivation to change. Participating in the CPA employment coalition for the purpose of information sharing and to troubleshoot challenges. Serving as a role model to clients and staff modeling pro-social behaviors. Summary : Job Developer with 11 years of experience is seeking to secure a full-time career working closely with people who need supportive services in their community. I am a dynamic, compassionate professional experienced with working with diverse populations in many different capacities. Exceptionally strong people skills, interviewing skills and is able to manage time effectively, with the ability to prioritize and meet deadlines with accuracy and efficiency under pressure. Assisted the participants with job searches and navigating employer websites. Provided support services needed for difficult to place jobseekers by referring to training programs. Facilitated and monitored large recruitments for employers seeking staffing assistance. Provided quality customer service, demonstrated enthusiasm, and provided my team with unlimited support. Consistently required to "think out of the box" in order to meet the needs of customers. Displayed the initiative, flexibility, and effective communication skills. Completed daily documentation of detailed activities for each customer. Worked with each jobseeker on resume building, interview skills, and professionalism. Built and maintained relationships with employers, keeping an active job bank. Worked effectively and collaboratively in a team environment to achieve placement goals. Responsible for ensuring that all services were focused on the outcome of employment. Summary : Job Developer II with 15 plus years of experience in the Social Service domain, with expertise in leadership, client and guest service, development and facilitation of training programs; adept at incorporating Company goals and strategies into programs and service delivery. Providing career counseling and employment support tools to women meeting the criteria of the displaced homemakers' network. 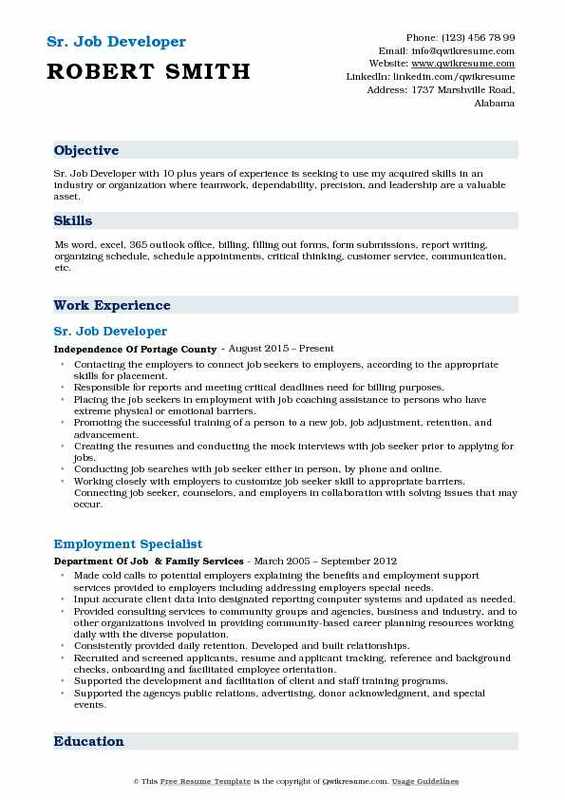 Helping in resume preparation, job search instruction, job club, computer training and case management. Producing agency print material including event and training flyers, monthly calendar, and media ads. Developing and facilitating the client and staff training programs and facilitating the community education presentations. Supporting the coordination of agency fund raising and community awareness events. Recruiting and training the volunteers through monthly orientation and direction of activities. Supporting the staff recruitment by receiving job applicant resumes, conducting background checks, on boarding and facilitating employee orientation. Internal consultant to management staff regarding the employee performance and evaluation. Conducting needs analysis to develop and facilitate leadership, customer service, and specialized staff training programs. 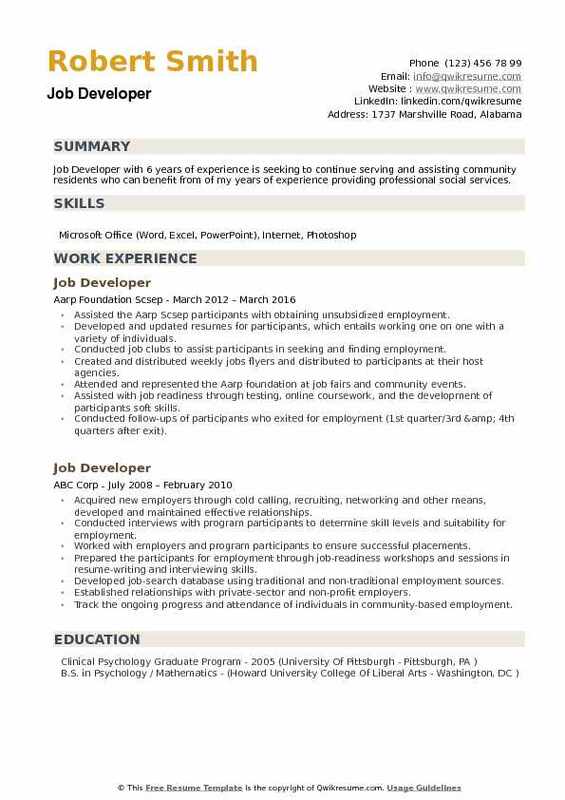 Summary : Dedicated Senior Job Developer with 7+ years of experience in the Education domain, working with the at-risk youth, non-traditional student (e.g. low-income adults and dislocated workers), and homeless populations. Works well independently and on a team. Skilled in instituting connections with businesses and community organizations in order to obtain services and employment for students/clients. Skills : Excellent Organizational, Time Management, Data Entry, Interpersonal Communication, Customer Service And Multitasking Skills In Addition To Being Very Flexible, Detail Oriented, Self-Motivated, Outgoing, Efficient, And Productive. Microsoft Office Proficiency: Skilled In Microsoft Word, Outlook, Excel, And Powerpoint. Developing and maintaining placement sites in the community for the students looking for jobs. Preparing and delivering lessons on employability skills to students. Assisting students with employability training services on a case by case basis. 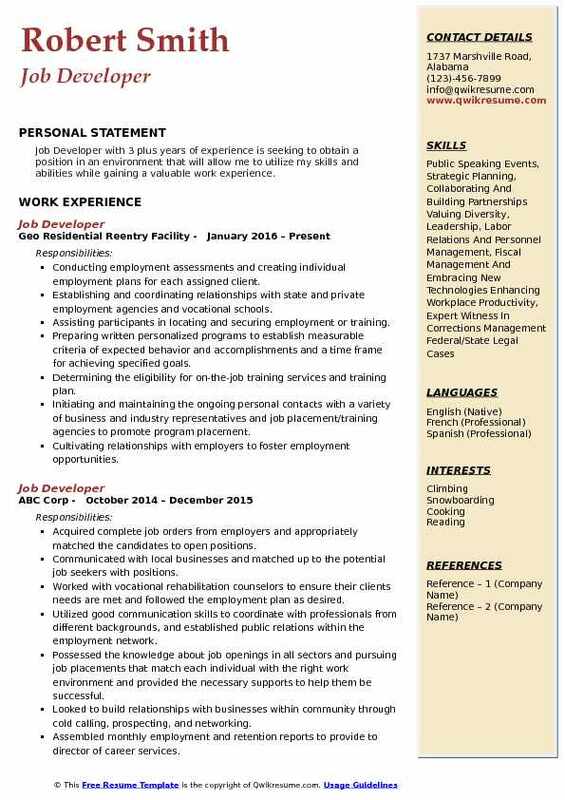 Providing students assistance with individual career assessments, resume writing skills and job search techniques in order to further assist them in finding employment. Maintaining up to date records in a database and manage students records. Monitoring arrival and dismissal of students and monitoring students on their breaks as well. Substituting as needed in the classroom and monitoring students behavior. Assisting in organizing and monitoring sporting activities, community service trips and other. Assessing and referring students for other programs that may better assist their needs. Summary : Sr. Job Developer with 10 plus years of experience is seeking to use my acquired skills in an industry or organization where teamwork, dependability, precision, and leadership are a valuable asset. Skills : Ms word, excel, 365 outlook office, billing, filling out forms, form submissions, report writing, organizing schedule, schedule appointments, critical thinking, customer service, communication, etc. Contacting the employers to connect job seekers to employers, according to the appropriate skills for placement. Responsible for reports and meeting critical deadlines need for billing purposes. Placing the job seekers in employment with job coaching assistance to persons who have extreme physical or emotional barriers. Promoting the successful training of a person to a new job, job adjustment, retention, and advancement. Creating the resumes and conducting the mock interviews with job seeker prior to applying for jobs. Conducting job searches with job seeker either in person, by phone and online. Working closely with employers to customize job seeker skill to appropriate barriers. Connecting job seeker, counselors, and employers in collaboration with solving issues that may occur. Writing detailed report of consumers daily, weekly, monthly outcomes for placement purposes. 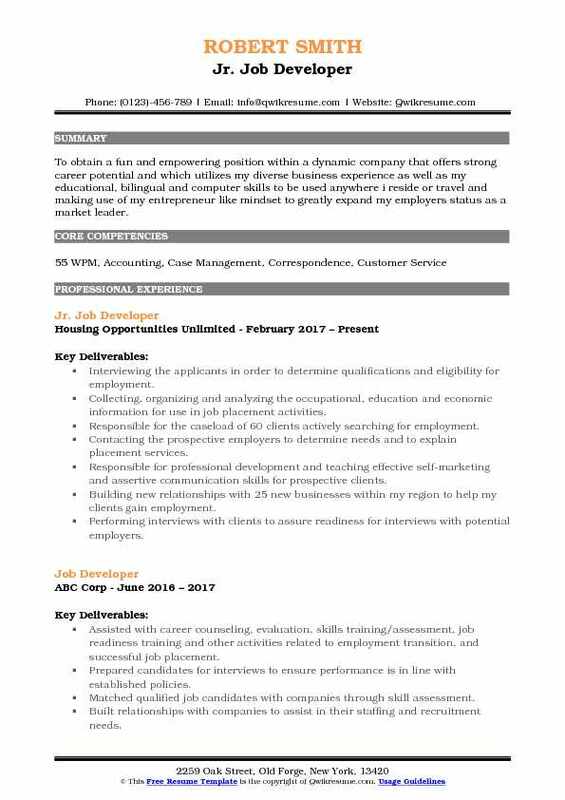 Objective : A knowledgeable Junior Job Developer with over four-plus years of experience assisting with Human Resource functions. By screening resumes, scheduling interviews, interviewing candidates, collaborating with team members, and completing the new hire paperwork. I've demonstrated the ability to successfully manage records in a discreet and confidential manner, while prioritizing workload to ensure that quality is maintained and deadlines are met. Screening the resumes of potential candidates, assessing their skills and qualifications for specific positions. Interviewing the candidates for opened positions at the agencies federal contracted sites ensuring that the most qualified candidates are hired to fill those positions. Submitting the agencies initial background checks for potential employees. Reviewing the i9 forms to verify that the applicant's information is accurate and submit it to the appropriate. Assessing clients job readiness skills and collaborating with them to set goals to prepare them for employment. Conducting job readiness workshops regarding resume writing and interview skills. Contacting various employers to assess their employment needs to match employers. Maintaining and updating the case files, inputting data into the company's database ensuring that all information is complete. Completing and submitting the monthly billing reports in a timely manner to the appropriate department. 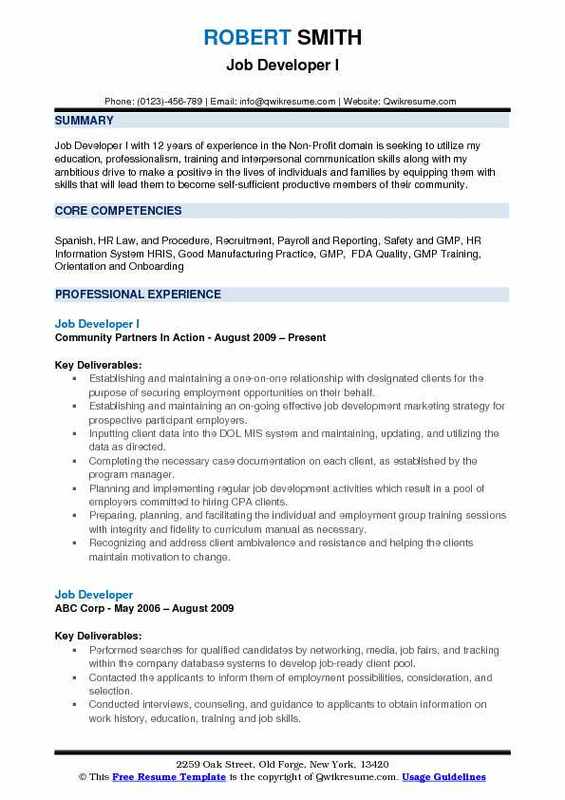 Objective : To obtain a fun and empowering position within a dynamic company that offers strong career potential and which utilizes my diverse business experience as well as my educational, bilingual and computer skills to be used anywhere i reside or travel and making use of my entrepreneur like mindset to greatly expand my employers status as a market leader. Interviewing the applicants in order to determine qualifications and eligibility for employment. Collecting, organizing and analyzing the occupational, education and economic information for use in job placement activities. Responsible for the caseload of 60 clients actively searching for employment. Contacting the prospective employers to determine needs and to explain placement services. Responsible for professional development and teaching effective self-marketing and assertive communication skills for prospective clients. Building new relationships with 25 new businesses within my region to help my clients gain employment. Performing interviews with clients to assure readiness for interviews with potential employers. Attending the job fairs to promote goodwills services to increase community awareness and program referrals. Maintaining accurate case files to show clients growth throughout program into competitive employment. 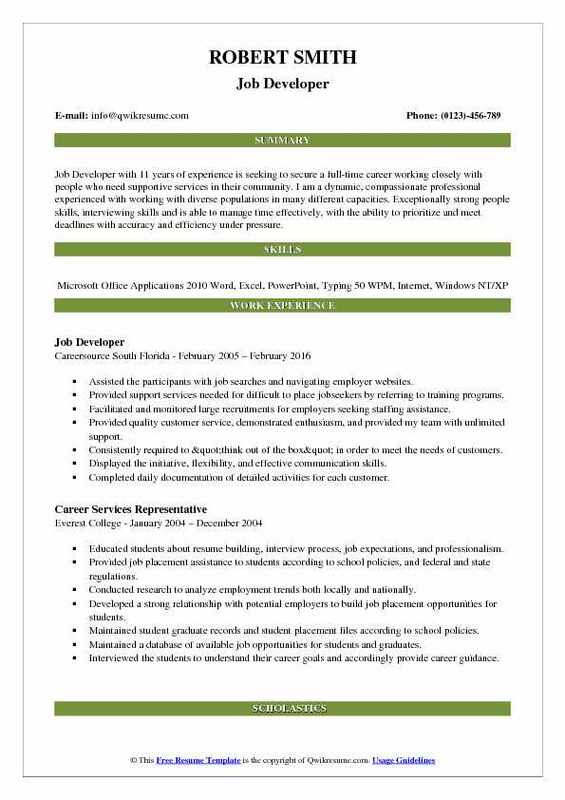 Objective : Job Developer with 3 plus years of experience is seeking to obtain a position in an environment that will allow me to utilize my skills and abilities while gaining a valuable work experience. Conducting employment assessments and creating individual employment plans for each assigned client. Establishing and coordinating relationships with state and private employment agencies and vocational schools. Assisting participants in locating and securing employment or training. Preparing written personalized programs to establish measurable criteria of expected behavior and accomplishments and a time frame for achieving specified goals. Determining the eligibility for on-the-job training services and training plan. Initiating and maintaining the ongoing personal contacts with a variety of business and industry representatives and job placement/training agencies to promote program placement. Cultivating relationships with employers to foster employment opportunities. 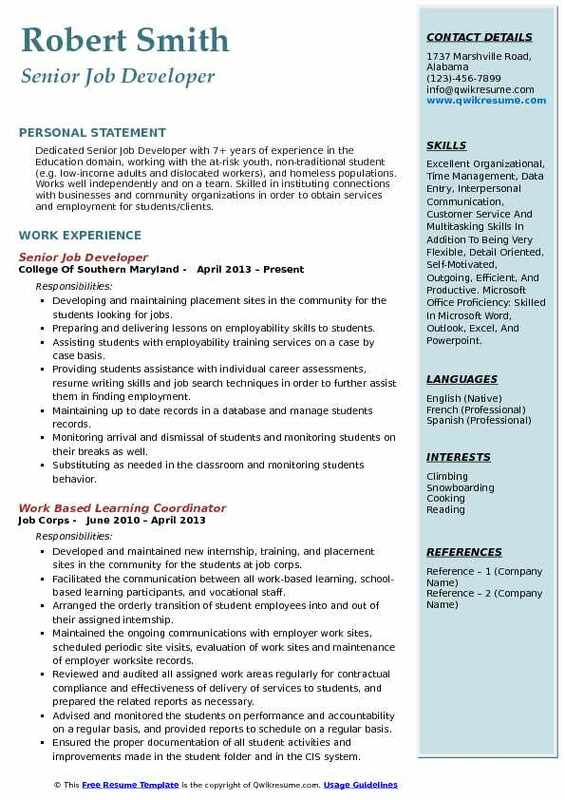 Developing resumes, teaching interviewing skills and techniques, counseled in coping mechanisms. 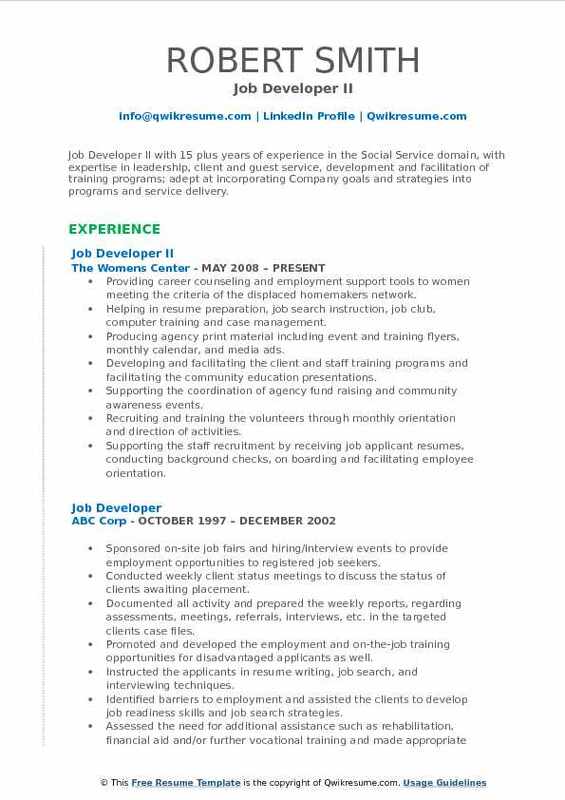 Headline : Job Developer with 6 years of experience is seeking to continue serving and assisting community residents who can benefit from of my years of experience providing professional social services. Assisted the Aarp Scsep participants with obtaining unsubsidized employment. 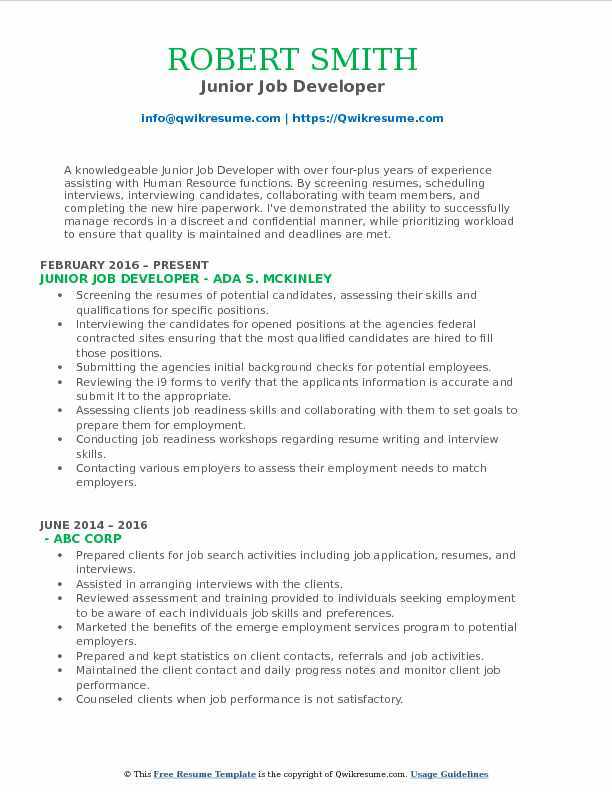 Developed and updated resumes for participants, which entails working one on one with a variety of individuals. Conducted job clubs to assist participants in seeking and finding employment. Created and distributed weekly jobs flyers and distributed to participants at their host agencies. Attended and represented the Aarp foundation at job fairs and community events. Assisted with job readiness through testing, online coursework, and the development of participants soft skills. Conducted follow-ups of participants who exited for employment (1st quarter/3rd & 4th quarters after exit). Provided clear feedback to interns and alumnus regarding work-readiness, boundaries, and expectations. Evaluated the effectiveness of services on a regular basis and made adjustments when necessary.